Time to change your snow shovel for a garden shovel! Today we can officially wave goodbye to the winter blues + say hello to the arrival of Spring! It might be a little cold + wet, but the evenings are slowly getting longer, the birds are chirping louder, the trees are starting to bud + the flowers are starting to blossom! Spring is about getting back outdoors, cleaning up our gardens, enjoying longer days, taking longer walks, opening our windows + breathing in some fresh, clean air. It’s about saying good bye to the greys of winter + saying hello to colours as the skies reveal blues more often, the grasses grow green + the flowers burst in magnificent shades. Spring is all about getting a little more energy back in our step! 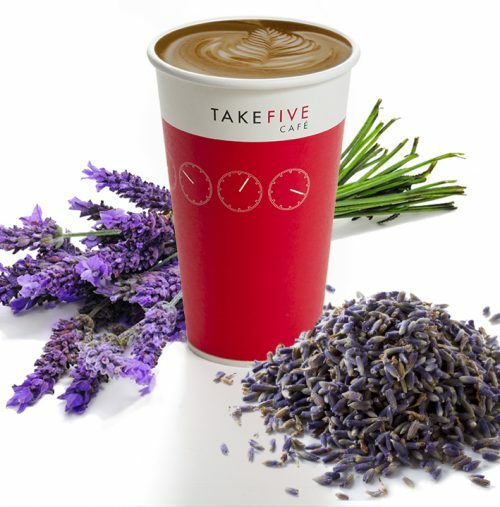 And nothing tastes more like Spring than our popular Lavender Latte. Our roasted espresso is slightly sweetened with lavender + lemon zest. It’s the perfect combination of soothing flavour + energizing espresso which we describe as ‘aromatherapy meets caffeine therapy’. We think it’s pretty special + can’t think of anything better to put a spring in your step! Come visit us at any of our 8 locations + give a toast to Spring with a Lavender Latte! It doesn’t get easier than that! Pink Shirt Day is getting closer + this year’s message is as important as always: Be Kind. As the cyber world continues to evolve, on-line bullying continues to grow. Bullying takes many shapes but perhaps what makes it the biggest threat is the ability for the perpetrator to remain anonymous. Whether it is harassment, spreading rumours or posting unauthorized photos, on-line bullying is a big concern. Pink Shirt Day is bringing us back to basics with this years message…just be kind! We would like to help spread kindness too! This year marks the tenth consecutive year that our Take Five Café family has supported the amazing Pink Shirt Day campaign. Our Pink Cupcakes will be back in stores starting February 4th + proceeds from the sale of Pink Cupcakes for the month of February will be donated to the CKNW Kids’ Fund in support of anti-bullying programs across British Columbia. So let’s get ready for February. Think business meetings, children’s events, office celebrations + more and place an order for these sweet treats. Our cupcakes can be ordered by calling 604.697.9050. To find out how else you can get involved or for a list of events in your area, read more about� Pink Shirt Day, or consider checking out the website for all of the available pink products. You can order the� official t-shirts to wear on February 27th, 2019 or purchase a stuffed bear, pink texting gloves, bracelets + more! Whatever you chose to do this Pink Shirt Day, it’s time to take a stand and make noise against bullying!….+ eat cupcakes, of course!! Than look no further! Dates are fast becoming the new healthy ingredient in many baked goods. Not only do they taste great, but they can be an effective substitute for eggs, sugar + butter in baking … of course, not all at the same time! More importantly, they can be a great alternative to sugar! Look up just about any healthy dessert these days + you’ll find recipes teeming with dates. The sweet, sticky fruit has found itself in brownies, cookies, granola bars, caramels, ice creams, puddings + pies. They are packed with potassium, vitamin B6, niacin, fibre + a small amount of iron. And if that’s not enough, sometimes they are simply added for texture + taste. Not convinced? 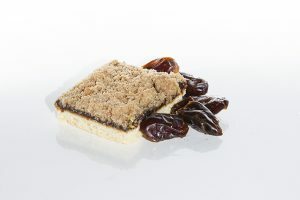 Visit us + taste one of our 4 delectable baked items that contain dates. We’ll let you be the judge! This muffin is full of everything you need to get a jump on your day: gluten free oats, flax seeds, dates, rhubarb, blueberries + walnuts. With a little more to offer than your basic favourite, it is healthier, moist, insanely delicious + just happens to be, gluten free! Corn flakes, almonds, pumpkin seeds, flax seeds, raisins, cranberries, sesame seeds + dates, all come together in a delicious + nutritious bar. A great alternative to a chocolate bar! One of the oldest “comfort desserts” out there….+ known to have several other names such as Matrimonial Cake, Date Bar, and more. These squares are oozing with dates whose taste is further enhanced with orange essence. Topped with house made oat crumble + you have a dessert that’s far from square! Don’t let the word “cookie” scare you away from this healthy treat. Full of oats, flax seeds, pumpkin seeds, sunflower seeds, cranberries, dates, carrots, dry apples, sesame seeds + almonds…a healthier twist to an old favourite! Tempted to try? Come in for a visit…after all, there is more than one way to find a “date” at a coffee café! September is the month of the year that has people convinced it comes with a switch. One day you can be basking in the sunshine + the next you can be keeping cover in the rain. It seems the cold snap evolves overnight + the rains appear on cue. Beach visits are changed to mall visits as back to school supplies + fall clothes need to be purchased. And chilled treats are replaced with warm sips as we move towards Autumn. Our Salted Caramel Bourbon Latte is a delicious combination of custom roasted espresso, perfectly steamed milk, infused bourbon, caramel + sea salt. We’ve spent time in our East Van kitchen crafting the perfect Bourbon infusion (we burned off the alcohol + kept all the flavour!) These all play together to give the delicious taste of a “spiked” coffee making this fall latte a popular choice. Stone Ground Teas. Made from stone ground black teas from India, our teas are blended with organic cane juice + other natural ingredients to produce amazing flavours! Our classic London Fog has bergamot + all natural vanilla, while our Authentic Chai includes spices like ground ginger, cinnamon, cloves + cardamom. Stone ground tea is different than traditional steeped teas – instead of soaking tea leaves in hot water + removing them, the tea leaves are ground into a fine powder + whisked into each beverage. When consumed, the body is able to absorb 10X the antioxidants + nutrients compared to steeped teas. 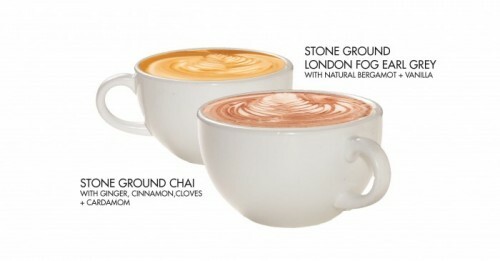 Whether you are interested in more nutrients in your cup or just love the extra flavour of stone ground tea, we suggest you visit + try a cup of our Chai or London Fog Tea. A warm sipper on a cool day! Elixo Tea is more than invigorating flavour – it has antioxidant benefits as well. Made with stone ground rooibos tea leaves, ginger, citrus, all natural honey crystals + cayenne pepper. It also contains camu camu, an Amazonian fruit with very high levels of all natural Vitamin C. Elixo helps fight colds – the ginger + citrus are known to boost energy + cayenne pepper is great for clearing sinuses! Combined with a hint of ginger, the flavour will rev up the palate + energize your senses. This tasty tea truly is a cup of antioxidants in disguise! Come in + try one of our feature beverages or create your own with help from a barista. At Take Five Cafe, our drink menu is just the beginning… your preference is the end! It’s no wonder summer is a favourite time of year. Warmer weather, outdoor activities, holidays, getaways + patios! If you are near a Take Five Café, we have sunny seating waiting for you! More than half our stores have patio seating …. Visit us in the BlueShore Building in North Vancouver, or the Axa Building on West Hastings. 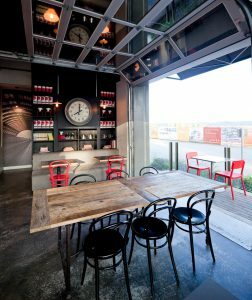 There is an awesome patio at our Brewery District location in New Westminster – in fact, one whole side of the café opens giving a whole new meaning to the term “open concept”. Sit outside at Surrey City Hall or in Coal Harbour at our Nicola location. Enjoy the sounds, the people, the action around you + stay an hour or an afternoon! See you at Take Five – on the patio of course! For the best break you’ll ever have! We all need a treat from time to time + sometimes it’s the treat that gets us through the day. Whether it’s a chocolate bar while working at a desk or an ice cream dessert on a hot summer day, a little indulgence goes a long way! It’s no secret that treats help us feel better + it’s been proven that treats help reduce stress + boost our mood! We like this theory + we’re holding to it! Whether it’s a craving you can’t resist or an excuse to treat yourself to something delicious – we have a treat waiting for you! 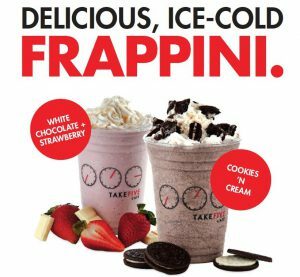 Come in + try one of our chilled Frappinis. Enjoy simple flavours like Vanilla, Caramel or Chocolate or take your treat to the next level + enjoy White Chocolate + Strawberry or Cookies N’ Cream – our take on a delicious creamy, chilled shake! If you’re feeling a little indulgent today we’ve got you covered! We say, life’s short, have dessert first! Blueberries are sweet + delicious! They are low in calories, high in fibre, loaded with vitamin C, have the highest antioxidant capacity of all fruits + veggies and are nutritious! Blueberries can be enjoyed fresh or frozen. They are an easy grab + go snack, can be used as a topping on pancakes, oatmeal or yogurt, blended into smoothies or easily folded into muffins or other sweet treats. Blueberries are a superfood! Visit us at any of our 9 locations + enjoy one of our tasty blueberry treats. 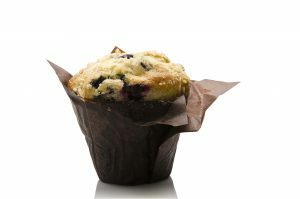 Whether you prefer your coffee paired with a muffin or enjoyed with a dessert, we have blueberry options waiting for you! There was a time when muffins could be considered as wedges of cake in disguise! Once the basic batter was dissected + the sugary toppings with artificial flavours were exposed, what was really left was a delicious dessert. But things are changing….the understanding of nutrition is evolving + bakers all over are switching direction. That’s not to say that everyone doesn’t enjoy a piece of cake now + then and it certainly doesn’t mean that every muffin needs something to boast about, but it does mean that there are more certifiably healthier choices out there. 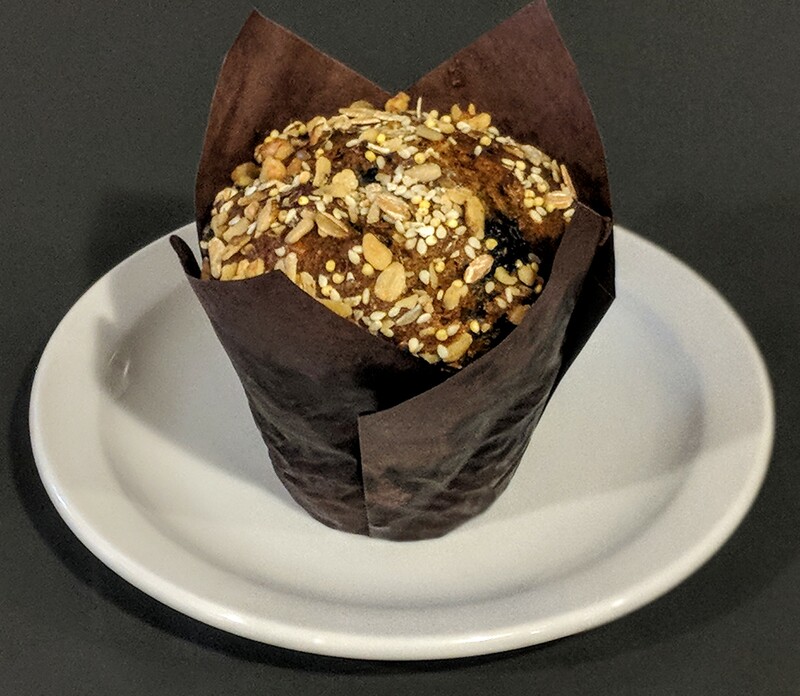 After receiving positive reviews from our loyal customers about a few of our healthier muffin options, our bakers have decided to add another addition to our muffin line. And in keeping with our mission of trying to offer something for every dietary need, this one happens to be gluten free! Meet the new Quick Start Gluten Free Muffin. It’s full of everything you need to get a jump on your day: gluten free oats, flax seeds, dates, chunks of rhubarb, blueberries + walnuts. With a little more to offer than your basic favourite, it is healthier, moist, insanely delicious + of course, gluten free! Visit us for a try + while you’re here, consider one of our other fan favourites: Gluten Free Fruit + Nut, Morning Glory, Oat Bran, Sugar Free Fruit or Vegan Chocolate. While we can’t promise a solution for every dietary concern, we are trying to promise a little something for everyone…one bite at a time! There are several months of the year that shine, but one of the months with the most to boost is March! Not only is Daylight Savings in March, giving us that extra hour of daylight we crave this time of year, but it is also the first day of Spring….a new season with lots to offer! If you have taken the time to look outside you will note the once bare trees now have buds. Flowers are emerging from the ground + the days are warmer + brighter! Windows can now be opened during the day letting in a fresh breeze + more time can be spent outdoors. All this magic creates a spring in our step + we feel this is cause for celebration! Come visit us at any of our 9 locations + give a toast to Spring with a Lavender Latte! Sweet Treat for a Great Cause! A kind gesture can go a long way but who would have thought that the kind acts of two Nova Scotia teens would start such a positive revolution? The teens bought + distributed 50 pink shirts after a male ninth grade student was bullied for wearing a pink shirt during the first day of school. This was the boys’ way of taking a stand against bullies. The concept gained traction and has become synonymous to standing up against all forms of bullying….years later the official Pink Shirt Day was introduced + every year the support for Pink Shirt Day gets bigger + louder! And Take Five Café is proud to be part of the movement! 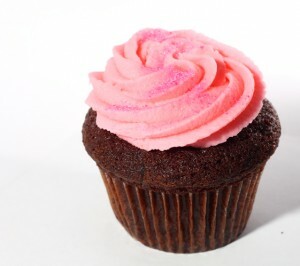 For the NINTH consecutive year, Take Five Café is supporting the amazing Pink Shirt Day campaign through the sales of Pink Cupcakes with all proceeds going to the CKNW Orphans’ Fund. Over the past eight years, over 12,000 cupcakes have been baked + sold with a total donation of just over $14,000!! And this year we are hoping to sell more! But we need you + time is running out! Until the end of February, cupcakes are available at all of our 9 Take Five Café locations. You can drop in + buy one for a friend or two but even better, you can place a large order for business meetings, classroom parties or special events by calling our Catering Department directly: 604.697.9050. 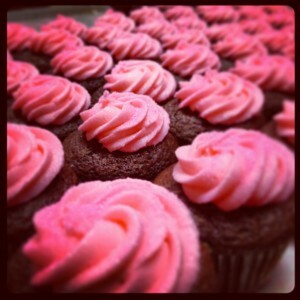 Pink Shirt Day is Wednesday, February 28th – the perfect day to have cupcake treats on hand! Together we can make a difference and stand up to bullying at home, at school or at the workplace. Take Five Café is proud to support such an important cause and hope you will consider doing the same. So what do you say? Sweet treat for a great cause….the cupcakes are calling!